The first meeting between the heads of the U.K and Scottish governments has gotten off to a tense start this morning. 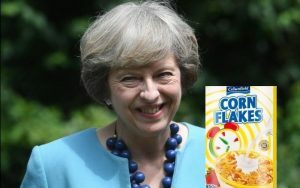 Theresa May wasted no time presenting Nicola Sturgeon with a big bag of Lidl own brand “Cornlike Crunch” and a single half open mini container of UHT milk. This was taken as an affront to Sturgeon who only drinks milk fresh from the teat of the finest Galloway cows. “Choke it down” said May. Sturgeon then held the cereal aloft, motioned towards her mouth, locked eyes with Theresa May and slowly poured the bowl’s contents over the new PM’s poorly concealed hooves. “Or just deep fried it, that always worked with Salmond”.